This entry was posted in Audio Tips, How-To, Production Tips, Uncategorized and tagged audio, digital, level, levels, recording, rule-of-thumb, sound by zed. Bookmark the permalink. Thanks so much for that! It was clear and very easy to understand for a Novice. Much appreciated. My pleasure. Thanks for the nice comment! After much of the internet wading-and-sifting you mentioned, I finally understand it. The fog has cleared and Thank you Sir! Thanks Zed for your crystal-clear explanations … refreshing! Hi there – the channel faders in your DAW usually only control your monitoring level, so the recording level should be set using the preamp gain. Hope that helps! Thanks, Zed – That’s what I thought probably happened , but wanted to make sure. Excellent information! I think I’m still not quite clear on something: Is this digital clipping actually going on in the hardware converters themselves? If so then yes, I can see why I would definitely need to trim back the preamps. After all, the DAW is ultimately just recording numbers and in the final analysis you could theoretically scale them how you want. i.e. I could for example use a trim or a gain plugin if I wanted to attenuate at the DAW stage. Sorry to be be such a clutz! Hey there – don’t worry – there’s no stupid questions – it’s not the easiest thing to get your head around. The “ideal” is to also avoid any potential clipping or unwanted colouration coming through your converters, but if your recording sounds great but it’s just recorded a bit too loud, then yes, you simply stick a trim/gain plug-in first in each channel strip to bring it back down. Note that some engineers love the sound of the “soft clip” in their Apogee converters so will deliberately record loudly through them to get the sound they want. So this is how they should also be trimming it back down in the channel strip to a reasonable working level in the DAW. I always thought that dBFS implicitly means “peak level”, and that the output of a 0 VU preamp with a sine wave was equal to “- 18 dBFS” (peak level). So I record at a peak level between -18 dBFS and – 8 dBFS (depending on the type of sound, almost 18 dBFS for sounds like bass or cello, higher for percussive sounds). On the table “Reference Levels – analog and digital scales”, are the three right columns in dBFS to be read in “peak level” or “RMS Level” (I think “peak” but maybe I am mistaken)? A friend of mine swears it’s RMS level, not peak level. Can you tell me what is right? Thank you in advance for your answer. Hi, actually you’re both right. dBFS is simply a scale; it’s mostly just meter ballistics that determine whether it’s measuring peak or average levels. So the scales in the table work either way. In a practical sense, you’re watching both your average level and the absolute peak for setting your optimum recording level – which it looks like you’re doing perfectly. Working out what the average level actually is on peak meters is tricky though – it’s nice to have a proper RMS or VU meter as well as the peak meter to help with that. If you have later-version Pro Tools you can try some of the numerous built-in meter options. Other DAWs typically have some metering options as well, or there are plenty of good metering plug-ins available (some even free). Hi ! Thanks for your answer. What do I have to do if I want well calibrate my converter with a sine noise at 1 kHz ? 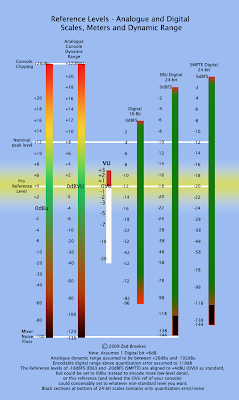 For 0 VU, do I have to read -18 dBFS in the peakmeter in my DAW input ? Or do I have to read – 18 RMS ? The RMS level is 3 dB lower than the peakmeter level. Or maybe it’s (quite) the same ? Thanks again for your help. In theory it shouldn’t make too much difference – VU meters can be calibrated against a sine wave or square wave and I think it does show up as a 3dB difference between the two. Unless you’re genuinely worried about sudden huge peaks, it’s probably better to aim for the higher version of the two VU levels. I’d just use the peak meter level for setting the signal to -18dBFS.